On January 30, 1649, King Charles I of England could have benefitted from a slight mix-up of the purposes and effects of Cupid and Death. The Puritans beheaded him that day for their amusement. You know, those Puritans who loved religious freedom, the same crowd that decided in 1642 to shut down all the theaters in London for being too licentious. You know, the Puritans who loved freedom of religion so they beheaded Charles I because his wife was a Catholic (the culmination of his evils). Gotta love those Puritans. The same bunch that founded the Massachusetts Bay Colony and made it illegal, among other things, to celebrate Christmas. I guess this is the religious freedom America was founded upon. 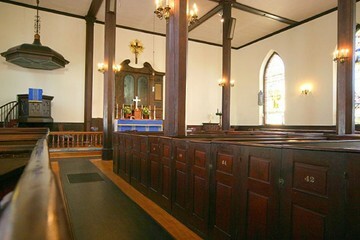 The complete ban on non-Puritan church organization and worship was lifted with the revocation of the original colonial charter by Charles I’s second son, King James VII, and the establishment of the Commonwealth in 1686; however, the taxation of citizens of Salem and Marblehead for the support of the Puritan churches lasted until 1833. Back to poor old beheaded Charles I.
Masques were dance extravaganzas given their raison d’être through organization around loosely-constructed stories, often from sources such as Aesop’s Fables. Masques comprised several “entrances” consisting of: instrumental introduction, solo music by the main characters telling the story, dances (courtly formal Renaissance figure dances), more dialogic story-telling (usually of some bizarre nature) either sung in elaborate recitative style or spoken, the “entrance” ending with a concerted musical piece for all the characters, chorus, and orchestra. The name “Masque” indicates the shows were performed in masks. When the cast was men, the masks helped disguise the drag. Over the years the costumes became more and more extravagant and outlandish, and the shows eventually became—one might say—fantastical drag shows. At the end of a performance, the theatrical dancers would mingle with the audience, and the production became an excuse for dancing the night away. 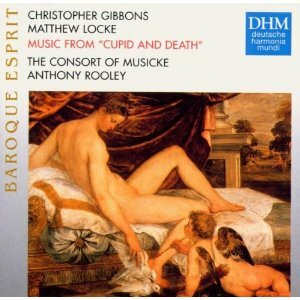 One of the most successful Masques was Cupid and Death, music composed by Matthew Locke and Christopher Gibbons, first performed in 1653. The show was so successful that the book and score for Cupid and Death was published twice, once 1653 and again in 1659. The story is mindlessly simple: Cupid and Death get their arrows mixed up; Cupid goes around killing people, and Death goes around making people that should be dead fall in love. Finally Mother Nature appeals to Jove to put an end to it, and Mercury arrives deus ex machina to put things right. 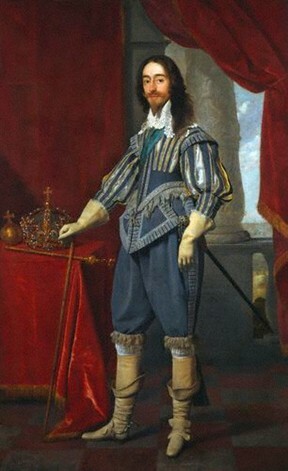 The unfortunate Charles I obviously could have benefitted from a performance of Cupid and Death. Too bad for him it came four years too late. I know, I know, this is degenerating into absurdity. But there is a connection to all of the history of Salem—and even to the hapless King Charles I. And this is connected to Charles I or Christmas in drag just how? It’s not, except by free association. Last night, exhausted from grading papers, I wanted to watch TV. All I could find was Christmas nonsense—bad music (Celtic Thunder), bad drama (Miracle on 34th Street)—and so on. Looking for a book, I came across my copies of Cupid and Death. Why, I wondered, can I not find anything as entertaining as that to get lost in. And I lost myself in reminiscences. The history of Salem churches is so intertwined with the history of Massachusetts and with the Puritan Civil Wars in England that it seemed in 1981 we were somehow following a tradition that had never been broken. The Puritan influence (dominance) of Salem. The lives of Salem musicians. In 1981 I was beginning my dissertation research and knew that the subject of my work, Henry Kemble Oliver, attended the dedication of the first building of Grace Church in 1858. This is all about awareness—my awareness—of traditions, of history, of the things that matter to me and the things that don’t. Churches matter in some way I can’t explain. Puritanism in any form does not matter. Music (both old and new) matters more than almost anything else. Christmas does not matter. Perhaps more than anything else, trying to understand how things came to be the way they are (myself included) matters. Cupid and Death probably wouldn’t have helped Charles I.
Puritans and kings need not apply. (1) Danko, C. “When Christmas Was Banned in Boston.” Massachusetts Travel Journal. masstraveljournal.com, July 4, 2009. Web. 12 Dec. 2010. (2) Knight, Harold. The Life and Musical Influence of Henry Kemble Oliver, 100-1885. Unpublished Dissertation. University of Iowa. 1988. (3) “Our History.” St. Michael’s Episcopal Church, Marblehead. stmichaels1714.org, 03/06/2010. Web. 12 Dec. 2010. (4) “Visiting and Town History.” Town of Marblehead, Massachusetts. Marblehead.org, 2006-2010. Web. 12 Dec. 2010. (5) “History of St. Peter’s.” St. Peter’s Episcopal Church, Salem, Massachusetts. stpeterssalem.org, 2008. Web. 12 Dec. 2010. (6) Locke, Matthew and Christopher Gibbons. Cupid and Death. Ed. Edward J. Dent. For the Royal Musical Association. London: Stainer and Bell Ltd.: 1974, 64-65. The substantive hatred for all things Roman Catholic endures. Only the form has changed.